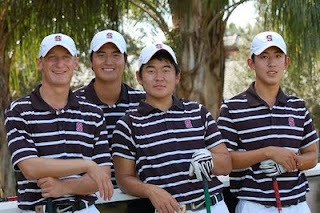 gostanford.com conducted this recent interview with All-American junior Sihwan Kim. 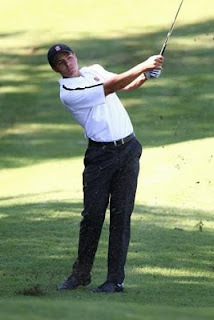 Sihwan is currently ranked 7th in the country individually among collegiate golfers. STANFORD, Calif. - If his fall results were any indication, Sihwan Kim has returned to the form that earned him first team All-America honors as a freshman two years ago. In four fall events, Kim enjoyed three top-10 finishes and placed second at the prestigious Isleworth Collegiate Invitational and the Gifford Intercollegiate to close the fall schedule. He compiled a stroke average of 71.3 in his 12 rounds during the fall and carded four rounds of 68. Kim's hot play during the fall has vaulted him into the top-10 of the national rankings, as he begins the spring ranked seventh by GolfStat and ninth by GolfWeek. "Sihwan has all of the tools," said head coach Conrad Ray. "He has really found a comfort level with his game and he's playing much more relaxed. Obviously, he had a great fall and we're hoping that momentum carries right over the spring." GoStanford.com recently caught up with Sihwan for this installment of "Right Down the Middle," which profiles the members of the Stanford's 2009-10 men's golf team. I don't really have one so I just play everywhere when I am at home. Favorite course you have played? Course you would most like to play? One swing thought you are always trying to remember? Favorite major championship to watch? Earliest memories of playing golf? My first swing coach dropped me because all I did was to sleep and play around in the driving range. And he told me that I had no potential to be a good player. So I tried really hard after that to prove him wrong. What's your most memorable round? When I beat David Chung(who is my teammate now) in the U.S. Junior Amateur in 2004 to be the second youngest to win the championship next to Tiger. What's your most memorable shot? When I had my first hole-in-one at Black Golf G.C. I use Korean money, 500 won. Favorite club in your bag? One thing you are constantly working on to improve as a player? I always try to enjoy golf regardless of how I am doing on the course. Why did you decide to come to Stanford? Tell us about your major? I am majoring in communications and it is about everything that involves words and gestures. Arriallaga Rec Center. I can workout, play basketball and squash. What are some of your interests other than golf? I love to play other sports like basketball, squash, tennis and soccer. Avatar by far. It changed my view of 3D movies. Lil Wayne mixtape "No Ceilings"
Breakfast quesadilla at Frank's Place. Photo of Ziegler, Kim, Yun and Chung. 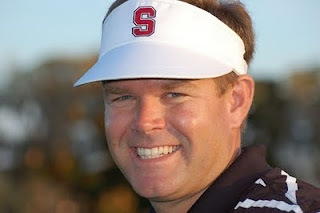 This article was published on the golf team website at gostanford.com. Stanford's men's golf program enters the spring portion of its season with one goal in mind--to win the national championship to be held at the Honors Course in Chattanooga, Tenn., in June. Six returning letterwinners along with three promising freshmen will lead Stanford's quest of securing the program's ninth national title. Juniors Sihwan Kim and Steve Ziegler, sophomore David Chung and the return of a healthy Joseph Bramlett give Stanford one of the most talented and deepest lineups in Conrad Ray's six-year tenure as head coach. Ziegler led the Cardinal in stroke average last year as a sophomore, earning first team All-Pac-10 Conference honors. Kim enjoyed two second place finishes this fall and looks to have returned to the All-America form that he demonstrated as a freshman when he was ranked seventh in the country at the end of the season. Chung, who won the prestigious North & South Men's Amateur Championship in July, is considered one of the top underclassmen in the country. Competition for the fifth spot in the lineup will be fierce, with senior Jordan Cox, juniors Graham Brockington and Wilson Bowen along with a trio of talented freshmen - Andre De Decker, Steve Kearney and Andrew Yun - looking to enter the mix. "This team is definitely one of the deepest teams we have fielded in recent years in terms of overall scoring ability," said Ray, who guided the Cardinal to the 2007 NCAA Championship and a runner-up finish in 2008. "They are confident in their abilities and have all played at a very high level." Stanford finished no lower than fourth in any of its four fall tournaments and captured the Gifford Intercollegiate championship in early November. The Cardinal also turned in impressive performances against strong fields at the Olympia Fields Fighting Illini Invitational (4th), The Prestige at PGA West (2nd) and at the Isleworth Collegiate Invitational (3rd). "We were very consistent during the fall and feel we can take even another step up this spring," said Ray. "I am really excited to see how our freshmen develop, as well." Ray knows a healthy Joseph Bramlett might be the key to the Stanford's NCAA championship fortunes. Bramlett, who at 14 was the youngest ever to qualify for the U.S. Amateur, has been limited to just nine events over the past two seasons due to various injuries. After being sidelined all of last spring and this fall, Bramlett hopes to return to form that he showed as a freshman, when he recorded a 71.5 stroke average and fired a final-round 69 at the NCAA Championships in leading the Cardinal to the national title. Bramlett's last collegiate tournament came in November of 2008, when he finished sixth at the CordeValle Intercollegiate Championships, his ninth career top-10 finish. "From every standpoint, Joe plays a big role on this team, obviously," said Ray. "When he is healthy, he is one of the most talented players in the country. We are hoping he can finish his career the same way it began--with a national championship." Jordan Cox joins Bramlett to round out Stanford's senior class. Cox, who qualified for the 2008 U.S. Open at Torrey Pines, will be a fixture in the lineup if he can demonstrate the consistency in his game that made him one of the top junior players in the country coming out of Serra High School in nearby San Mateo, Calif.
Cox carded a 77.5 stroke average in two tournaments this fall and was limited to just four events last year. "The talent is there," said Ray. "Consistency will be the key for Jordan. The competition for the fifth spot in the lineup will be outstanding all spring." Stanford features two of the top juniors in the country in Sihwan Kim and Steve Ziegler. Kim was Stanford's most consistent player during the fall, posting three top-10 finishes in four outings to go along with a team-best 71.3 stroke average. He closed the fall with back-to-back second-place finishes at the Isleworth and Gifford Intercollegiate Championships. Kim, who earned first team All-America honors as a freshman when he finished the year ranked seventh in the nation, has played in 28 tournaments since arriving on the Farm in the fall of 2007, carding a 72.5 stroke average. "Sihwan has the full scope of tools," said Ray. "He is so naturally talented and hits the ball so far. I think his mental approach is much better this season, which is good sign of his maturity as a golfer." Ziegler earned first team All-Pac-10 honors last season after leading the Cardinal in stroke average (72.5) as a sophomore. He enjoyed five top-10 finishes on the year and captured his first collegiate title at the USC/Ashworth Invitational. A native of Broomfield, Colo., Ziegler enjoyed a sensational summer, winning both the Colorado Golf Association Stroke Play and Match Play championships, becoming just the ninth player to win both events in the same year. He also qualified for the match play portion at the U.S. Amateur. "Steven might be the difference for us this spring," said Ray. "I think he will be the first to tell you he had an average fall by his standards, but he knows how to win. He's one of out steadiest players, no doubt." Graham Brockington, who competed in three events during the fall and carded a 75.9 stroke average, will compete for a regular spot in the spring lineup. "Graham displays the work ethic and desire that we all need to succeed as a team," said Ray. "No one works harder and that will raise the level of everyone around him. He is a big asset." David Chung made an immediate impact last year as a freshman, earning second team All-Pac-10 honors. His stroke average of 73.8 was the third best on the team behind Ziegler and senior Dodge Kemmer (73.8). Chung further served notice that he is one of the top young players in the country last summer, when he captured the prestigious North & South Men's Amateur Championships held at Pinehurst No. 2, just outside of his hometown of Fayetteville, NC. "David has no weaknesses," said Ray. "His win at the North & South did so much for his confidence level." Wilson Bowen, who is in his second year in the program, redshirted last year a freshman. He saw his first collegiate action this fall at The Prestige at PGA West, where he tied for 78th. Stanford welcomes a trio of talented freshmen to the Farm this season in Andre De Decker, Steven Kearney and Andrew Yun. Yun, a native of Chandler, Ariz., was a constant presence in the fall lineup, competing in all four events and registering a 74.0 stroke average, highlighted by a third-place finish at the Gifford Intercollegiate Championships at CordeValle. A four-time American Junior Golf Association All-American, Yun was ranked as high as fifth in the AJGA rankings that were released last August after a second-place finish at the Porter Cup in July. "Andrew is a very accomplished, young player who will push some of the veterans," said Ray. "He will be a mainstay in the lineup for years to come." De Decker was the second ranked junior player in South Africa coming out of high school last year and was a member of the South African Under-16 Junior Team. Kearney, a native of Carlsbad, Calif., was the top-ranked junior player in the San Diego area and was ranked among the top-30 junior players in the nation last year. Golf Digest/Golf World article about Joseph Bramlett, Stanford's All-American senior captain who has been injured much of the past two season. 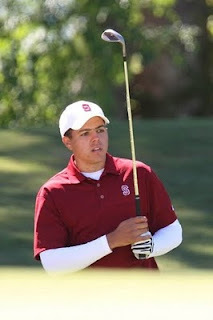 In this week's issue of Golf World, my story in the Amateur Spotlight section focuses on Stanford senior Joseph Bramlett, who is back practicing with the Cardinal and hoping to crack the starting lineup this spring as he finishes up a injury-hampered career. Last month, doctors agreed his right wrist was strong enough to allow the 21-year-old from Saratoga, Calif., to play 18 holes again. He's trying to qualify for the one open spot in the Stanford lineup when the team plays in Hawaii early next month. Quick set-up: After playing 13 tournaments his freshman year (2006-07), posting a 71.5 average, earning second-team All-American honors and helping Stanford claim its first NCAA title in 14 years, Bramlett has played in just nine college events in the past 31 months, hampered by two separate freak injuries to the wrist. Suffice it to say, in my phone interview with Bramlett last week, you could tell he is pretty pumped about getting get back to a regular practice routine with the rest of his teammates. "It’s been exciting … to get a little bit of that trash talking again once you get back on the course, and then backing it up," he joked. Certainly Bramlett confesses there were a few "why me" moments during the past few years as he had set backs after a lot of hard work rehabbing the injury. Amazingly, though, this is a young man who has handled the situation with great maturity. Cameron Wilson isn’t playing golf these days. Golfweek’s No. 8-ranked junior hasn’t been on a course since November, and he isn’t shagging balls at the range either. In fact, Wilson hasn’t swung a club in nearly two months and doesn’t plan to hit his next golf ball until March. Wilson, 17, of Rowayton, Conn., is in the midst of his annual 3 1/2-month break from the game. While freezing temperatures and snow prevent him from playing golf during the winter, it hasn’t stopped him from competing. Instead, he satisfies his competitive desire on the squash court – hitting a small, hard black ball instead of a small, hard white one. As the No. 4 player on the squad at St. Luke’s School in New Canaan, Conn., he’s not quite as accomplished of a squash player as he is a golfer. Then again, when you’ve achieved as much as Wilson has on the golf course, it’s understandable. Though Wilson has fun on the hard court, his game on grass suffers. He usually ends squash season with problems in his golf swing. Because his right-handed backswing in squash is similar to his lefty backswing in golf (Wilson is ambidextrous), he picks up bad habits such as bending his knees too much, moving his head, shifting his weight forward too early and getting off balance. It usually takes Wilson a few weeks of practice to get rid of the bad tendencies. But after going through this routine for years, Wilson and his parents know to set his schedule light in the early part of the season, then rev it up as the year goes on. In 2009, Wilson hit his stride in early summer and took off from there. He qualified for the U.S. Amateur, where he advanced to the second round of match play, made it to the quarterfinals at the U.S. Junior and won the AJGA Nationwide Insurance Junior. Yet Wilson considers his 2009 Metropolitan Golf Association Player of the Year honor to be his most rewarding accomplishment because it was the product of a summer’s worth of good play. He’s the youngest MGA Player of the Year recipient, thanks to wins at the MGA Met Amateur Championship – where he also was the youngest-ever winner – and the MGA Carter Cup, where he beat players like David Pastore (No. 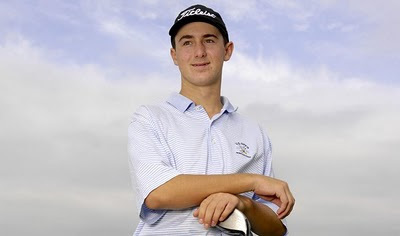 68 in the Golfweek/Titleist Junior Rankings), Sean Kelly (No. 75) and Mike Miller (No. 77; and winner of the Golfweek Junior Invitational). Click here to read the complete article in Golf Week.